Frenchman, Antoine Griezmann claims he's on the same level as Lionel Messi and Cristiano Ronaldo as he sets his sight on winning the 2018 Ballon d'Or while opening up to improvements on the field. The 27-year-old wassnubbed on the FIFA's The Best award shortlist. The World Cup-winning France forward missed out on the three-man shortlist for FIFA's The Best award, the winner of which will be announced on September 24, but he is nevertheless feeling confident of his chances of being named the world's best player later in the year. In contrast to FIFA's prize, the Ballon d'Or winner is determined by votes from journalists, and Griezmann described the prize as more prestigious. "I think the Ballon d'Or has more prestige and history," he told AS . "There's three months left to give everything. "It is clear that I am a different player than Cristiano Ronaldo, Messi, Neymar or [Kylian] Mbappe. I'm at the top but I can improve. "I seek to be as complete as possible. I'm not going to score 50 goals, but I'm looking to help offensively and work for the team. "I think I already sit where Messi and Cristiano are. And I know other players are going to come for sure. "I want to improve, I want to win and I want to continue like this, playing in this way." 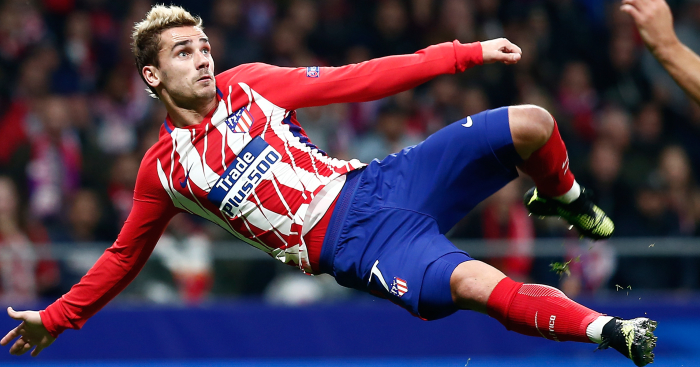 Griezmann was heavily linked with a move to Barcelona during the summer transfer window, but he explained that his decision to turn down a move to Camp Nou was in part a tribute to his team-mates and head coach Diego Simeone. "Saying no to Barcelona gives greatness to Atletico, Cholo [Simeone], my team-mates," he said. "I trust them and we contribute to each other a lot. "I stay where they give me more love. If it was for money, I would have gone to China. "It was a very important decision for my future. You do not only look at one year, you do it thinking about four or five. It wasn't as easy as choosing a candy." Atletico's disappointing start to the new La Liga season continued on Saturday as they drew 1-1 with Eibar, with Monaco up next for Simeone's men in the Champions League on Tuesday.